April 3, 2012 ~ Daniel "Dan" Tangherlini, a former top aide to Mayor Adrian Fenty has been tapped by the White House to head the General Services Admnistration following the resignation of its administrator over "excessive spending." Since July 2009, Tangherlini has served as Assistant Secretary of the Treasury for Management, Chief Financial Officer, and Chief Performance Officer at the U.S. Department of Treasury under Secretary Timothy F. Geithner. Tangherlini is a graduate of the University of Chicago and earned an M.B.A. from the Wharton School of the University of Pennsylvania. Tangherlini began his career as a Presidential Management Intern at the Office of Management and Budget in 1991. He held several positions at OMB and in 1997 he transferred to the Department of Transportation, where his work included Amtrak labor settlement negotiations and development of new approaches to infrastructure financing. In November 1998 Tangherlini was loaned to the District of Columbia government, where he served as acting-CFO for the Metropolitan Police Department. The position as the CFOr for the Metropolitan Police Department became permanent, and Tangherlini remained in the role until May 2000. He then was appointed as the director of the District of Columbia Department of Transportation (DDOT) until February 2006. Tangherlini withdrew from consideration as Metro's permanent General Manager after accepting the position of City Administrator in the cabinet of Adrian Fenty, then Democratic nominee for Mayor. Following Fenty's election, Tangherlini became his Deputy Mayor. In May 2009, President Obama nominated Tangherlini to be Assistant U.S. Treasury Secretary, where he served until yesterday, when he was appointed GSA's acting Administrator. Tangherlini is married to Theresa Picillo and they have two children, Cassandra and Francesca. 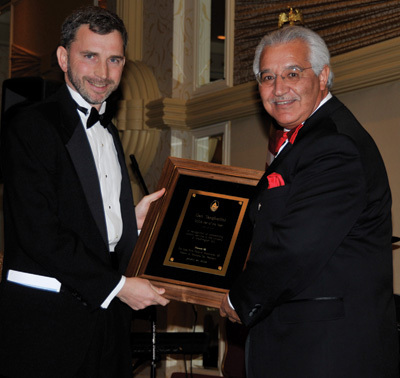 In 2009, the Lido Civic Club in Washington, DC, honored Tangherlini with its Man of the Year Award.